The MI-500, MI-750, and MI-1000 mounts are each available in a German equatorial and an equatorial fork configuration. The MI polar cone and base are identical in either configuration. The polar cone houses the bearing assembly, right ascension axis, drive gear, and DC servo motor. The rocker base supports the polar cone, and includes azimuth and altitude adjustments for polar alignment. Each type of mount has distinct advantages and some limitations. Choosing the best design will depend on the type, weight, and dimensions of the telescope tube assembly. The equatorial fork mount is excellent at holding compact tube assemblies. Unlike the German mounting, a fork mount tracks objects continuously through the meridian, i.e. no German roll-over. These mounts are often used with Cassegrain optical systems. Generally, fork mounts provide easy access to the telescope focal plane, which is usually a short distance below the axis passing through the upper ends of the fork arms. The MI equatorial fork mounts offer a minimum "footprint" in the design of an observatory, with the added benefit of continuous tracking across the sky. Since fork mounts do not need the large counter-weights of the German mount, fork mounted instruments are usually more compact. 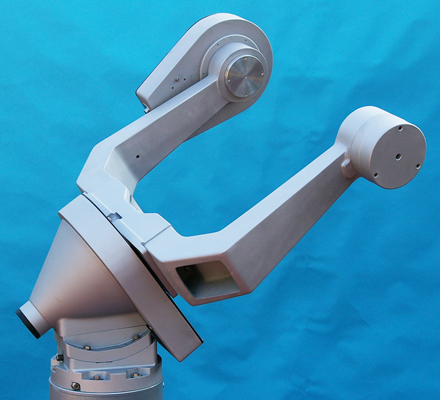 Forks do use a small counter-weight on one fork arm to balance the declination gear drive on the opposing arm. However, fork mounts have a smaller load capacity than the equivalent German mount, since the telescope tube is suspended far from the center of the mount column or pier. Also, fork mounts are machined for a specific arm separation, making them less versatile at handling a variety of telescope equipment. The short length of the fork arms does not accommodate the long tubes of refractors and Newtonian telescopes. 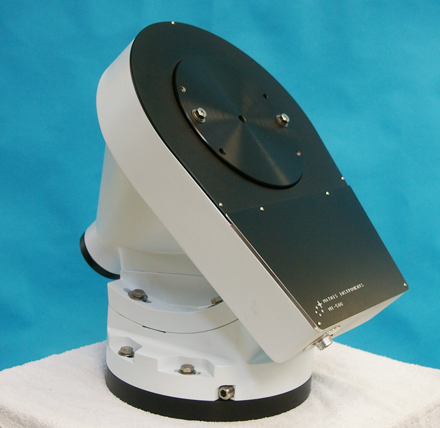 The German equatorial design is a classic telescope mounting that is capable of handling a wide variety of optical tube assemblies. By simply changing the position of the counterweights, a variety of equipment can be easily attached to the mount. Since the center of mass of the optical tube assembly is usually near the center of the supporting column or pier, a German mount can generally carry a heavier load than the equivalent fork mount. 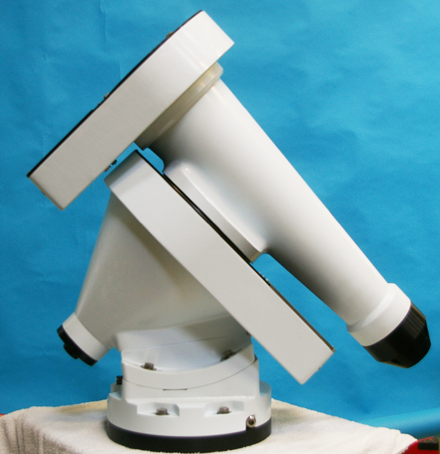 German equatorial mounts can handle the long tubes of refractors and Newtonian telescopes. One disadvantage of the German design is the need to "flip" the telescope tube when the object you are observing passes through the meridian. The telescope must be moved from one side of the pier to the other, often referred to as "roll-over". A related issue is that near the meridian one must be alert that no part of the telescope hits the pier or column. With its long declination axis and heavy counter-weights, a German mount has a large footprint, and the focal plane of the telescope can sometimes be in an awkward viewing position. Also, a German mount has effectively two coordinate systems: one on the east side of the pier and one on the west side. However, with good mount modeling, this problem can be minimized.